Ocean Craft Marine (OCM) unveiled their new brand of boats and new high-performance Vessel Interdiction and Boarding-Team Delivery Craft (VI-BTD) last week at the High-Performance Craft Expo (HiPer Craft) 2012 in Norfolk, Virginia. 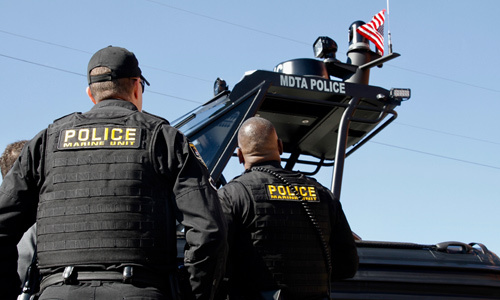 These unique high-performance boats were specially designed for elite law-enforcement and military mariners. “We saw unique opportunities to partner with fellow marine Industry leaders and collaborate on constructing a new range of high-performance boats pairing the latest advances in maritime shock-mitigation and communication systems with the Ocean Craft Marine superior performing concave-chine hull designs,” said Todd Salus, Ocean Craft Marine Vice President. Ocean Craft Marine partnered with the design team at Professional Components Ltd., makers of Shockwave Seats®, to highly customize and adapt a three-axis, and fully shock-mitigated operator console known as the Integrated Control Environment or ICE2TM. In addition, the latest 9900 Series TM fully integrated, wireless crew-communications system was specially adapted by the David Clark Company® along with a M-Series thermal imaging camera from FLIR® Systems, Inc.
“The 9.5M V-BTD with its completely blacked-out visual appearance, super quite, twin 300HP Mercado VeradoTM supercharged engines and a shock-mitigated console with both a low-profile and oblique angled leading edge make for an extremely stealthly and agile package on the water.” “With four integrated hoisting hard-points this boat is ready for shipboard launch and recovery as well as transportation by rotary wing aircraft.” “The seamless integration of technologies and extreme high-performance capability of this boat must truly be experienced first-hand,” said Salus. Ocean Craft Marine has a comprehensive and dedicated range of boats designed to accommodate all professional mariners whatever your mission profile may be. Whether you need a patrol boat, a special operations assault craft, troop transport vessel, tow boat or a pure inflatable our passion and enthusiasm to deliver an outstanding product prevails. The Ocean Craft Marine philosophy of Design, Safety, Performance and Quality are built into each boat with the utmost attention to detail. Our ISO rated factory ensures that each boat is built to stringent CE/NMMA/ABYC standards. Ocean Craft Marine differs from most boat builders as we manufacture almost every component in-house. 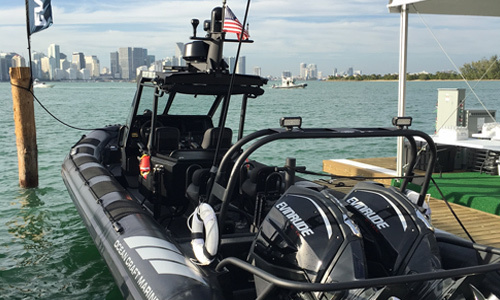 Ocean Craft Marine is a U.S. based and privately owned company specializing in highly customized, maritime solutions for the elite military, law enforcement and commercial mariner. Our offices are located on the water in Annapolis, Maryland. More detailed information is available on our website www.oceancraftmarine.com. We are standing by to serve all your maritime needs. When visiting our website, please sign-up to recieve catalogues, newsletters and product updates. From the entire Ocean Craft Marine professional Products Team, we hope your next underway mission is a safe one!